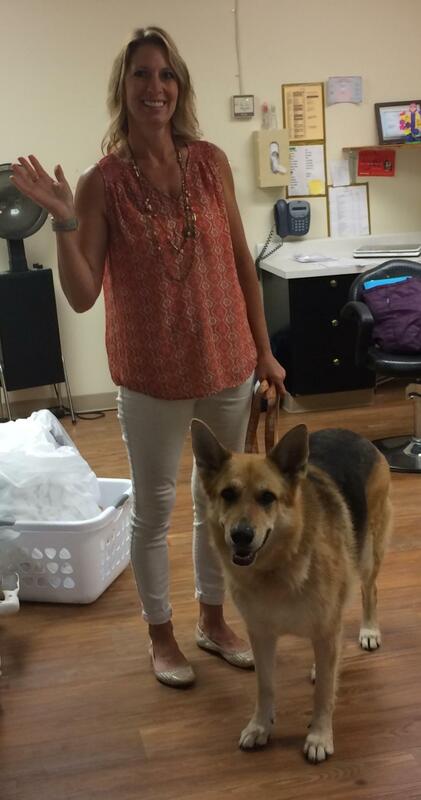 It was a good bye "for now" as our dedicated Stylist Bernadette Leibensperger & her beautiful therapy dog, Summer, said a fond farewell to residents & staff @Laurel Center, PA on 8/7. Bernadette began her career with Matura 7 yrs ago in a coverage position and then, decided to stay on permanently. Bernadette will definitely be greatly missed - her enthusiasm, talent and beautiful smile made all the difference in the lives of many residents. Not to mention Summer who was fed her last milk bone by administrator Stephen Zablocki! We wish Bernadette every happiness as she begins her hands on work as a grandmother with her beautiful granddaughter. Thank you Bernadette for a job beautifully done!